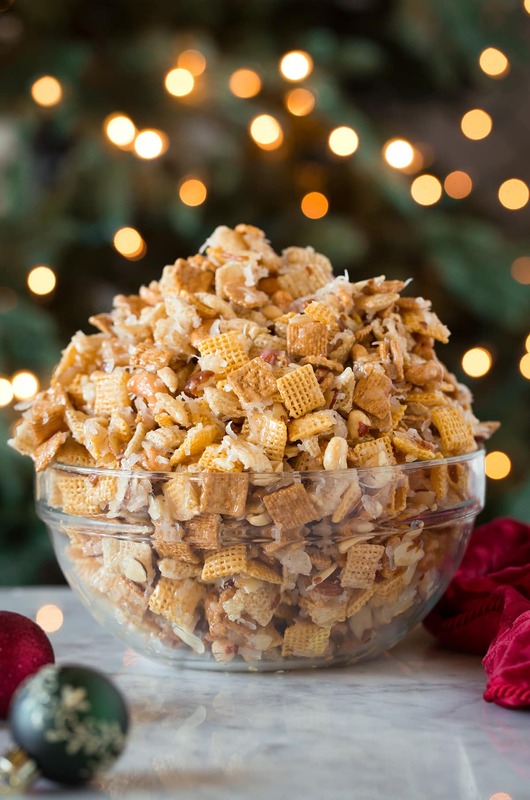 Sweet Holiday Chex Mix is a staple recipe every Christmas season at my house! Sometimes I make it for gifts and sometimes I’ll make a batch for a party, then other times I just get the craving for it so I’ll whip up a batch on the weekend. It’s perfectly crunchy and covered with an ooey gooey sweet coating. 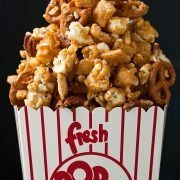 Just be careful because this stuff is addictive! If there’s one treat you must make this season this is it! 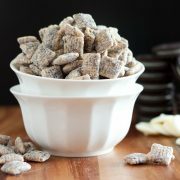 Okay there are a lot of treats that definitely deserve to be made this holiday season but this one should be near the top of your list. 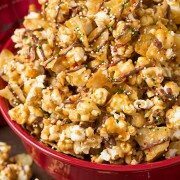 It’s incredibly easy and so fast (we are talking 15 minutes or less), it tastes like candy with a crunch, it’s nutty, it’s sticky, it’s crave-ably sweet and it’s the perfect gift for friends, neighbors, or coworkers. 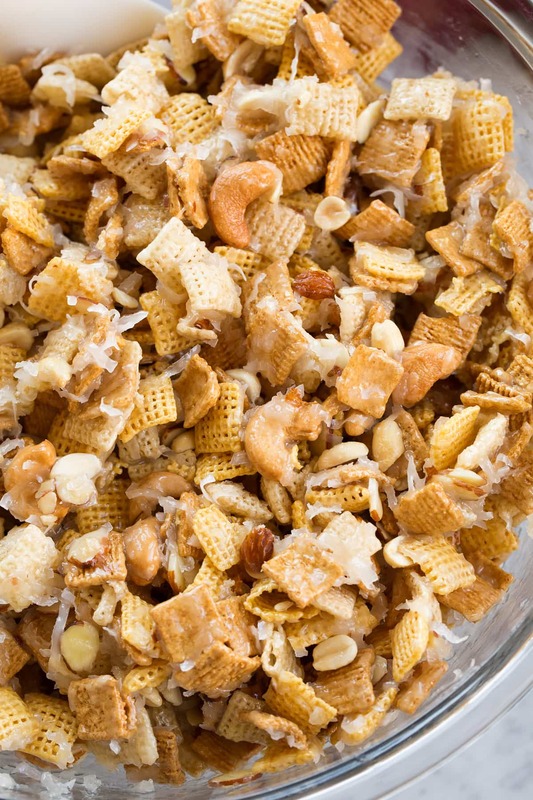 In a large mixing bowl, toss together Rice Chex, Corn Chex, Golden Grahams, mixed nuts and coconut, set aside. In a medium saucepan combine sugar light-corn syrup and butter. Bring mixture to a boil over medium-high heat, stirring occasionally. Allow mixture to boil for 2 minutes, stirring occasionally. 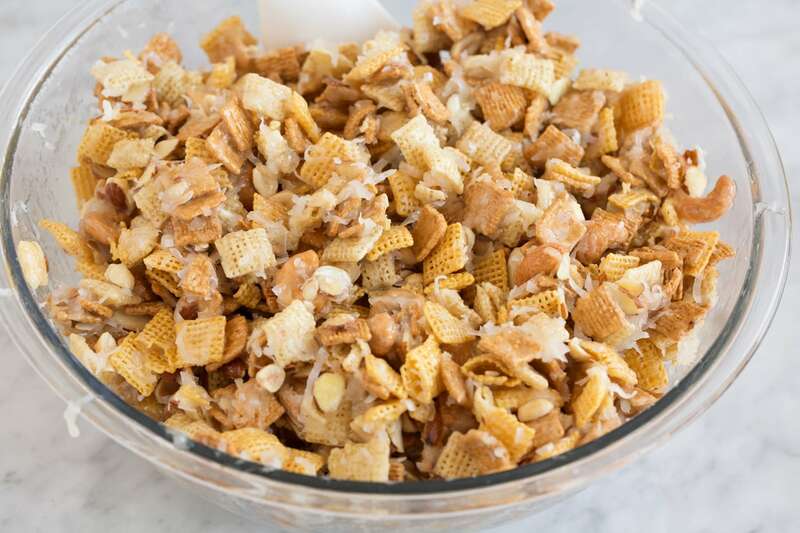 Remove from heat and carefully pour sugar mixture over cereal mixture and toss to evenly coat. Don’t just simmer the mixture for 2 minutes let it come to a boil then start counting down the two minutes. Don’t skip the coconut even if you aren’t normally a fan. It’s not overpowering here, it blends in with the flavors nicely. You can use one type of nut, but if you have multiple on hand go for a blend. 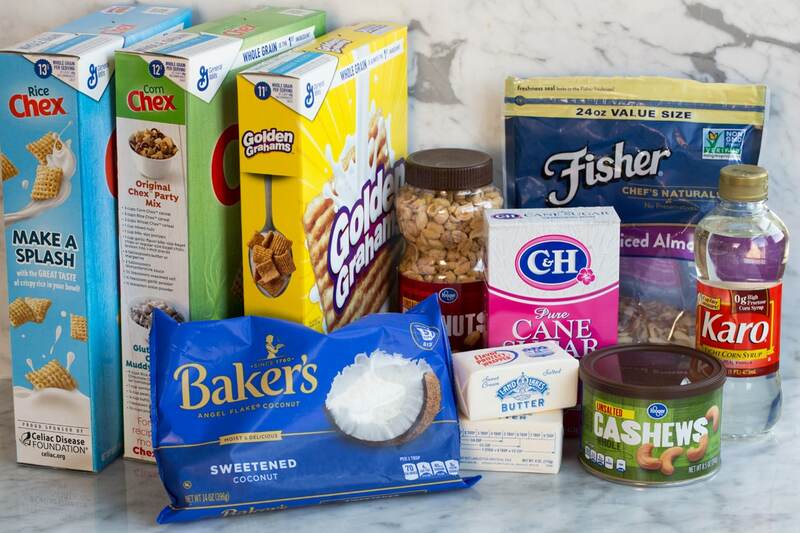 Peanuts, sliced/slivered almonds, cashews, pecans or walnuts are all great choices. 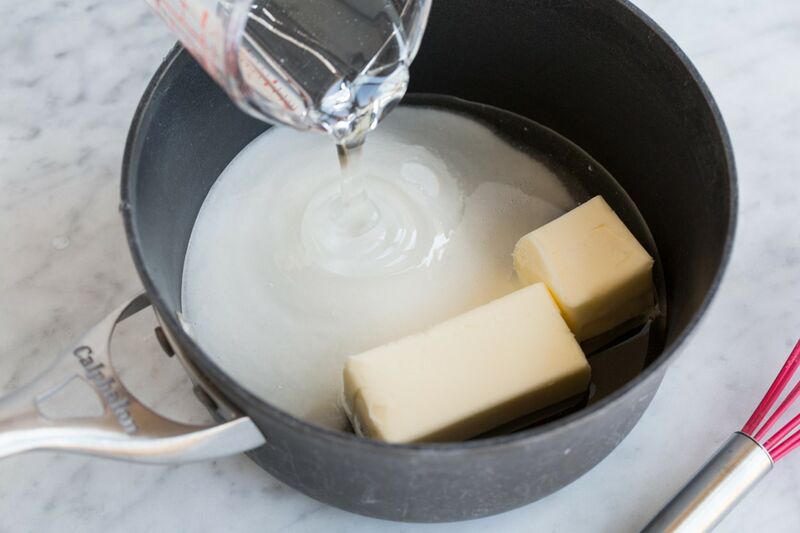 You can use unsalted butter if that’s what you’ve got on hand. Then just add a heaping 1/4 tsp salt to the sugar mixture before cooking. 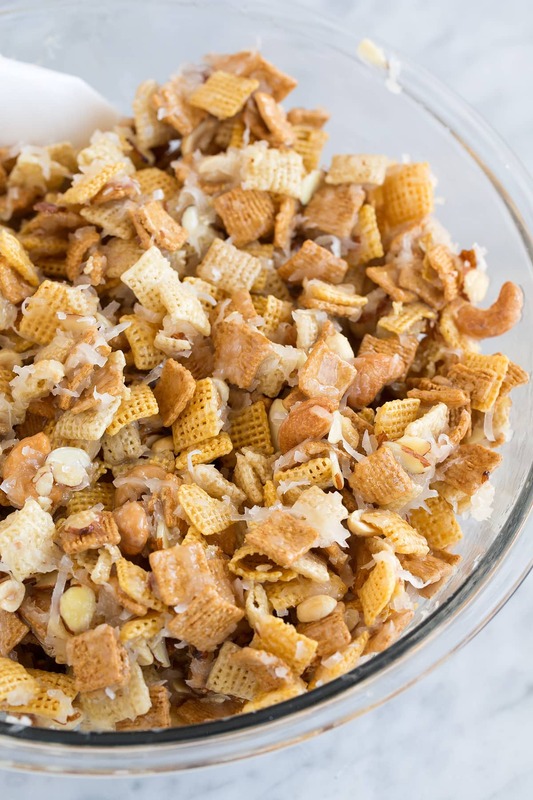 This sweet Chex mix is a staple recipe at my house every Christmas season! It's perfect for gifts and parties, but be warned it's highly addictive! 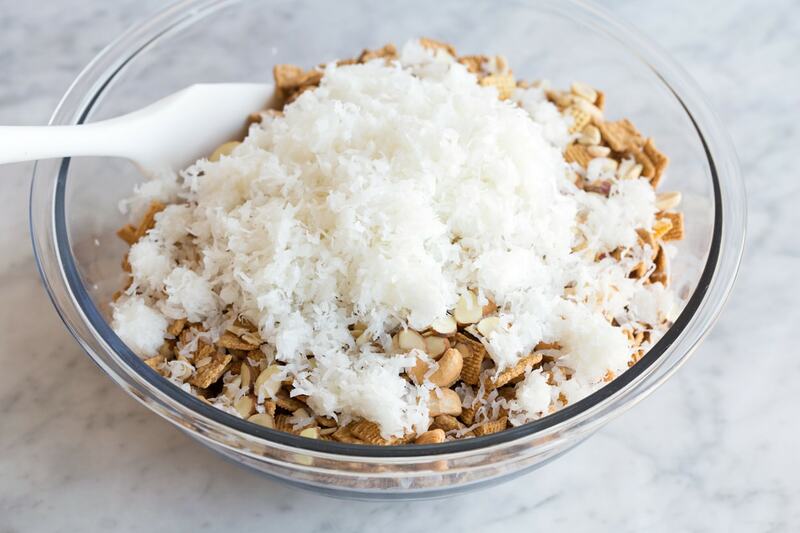 It's loaded with crunchy cereal, dotted with mixed nuts, and swirled with coconut. Then it's covered with an ooey gooey sweet and sticky coating. The best part - it couldn't be faster or easier to make. In a medium saucepan combine sugar light-corn syrup and butter. 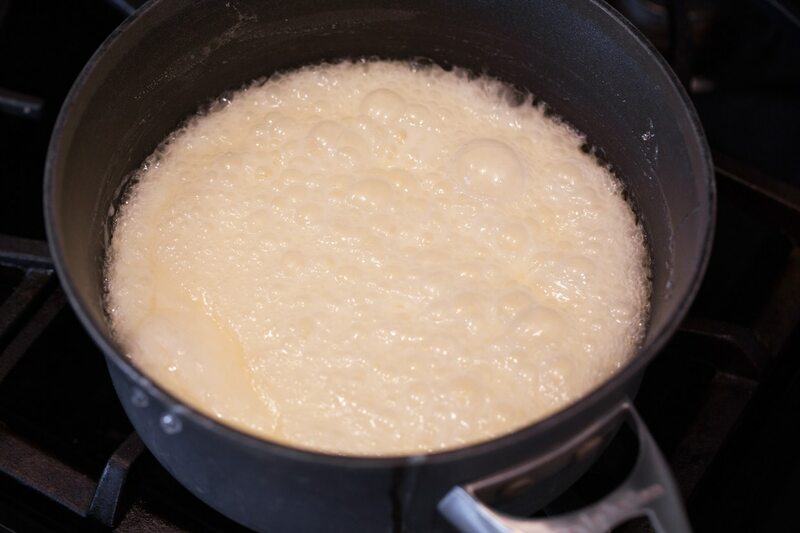 Bring mixture to a boil over medium-high heat, stirring occasionally. 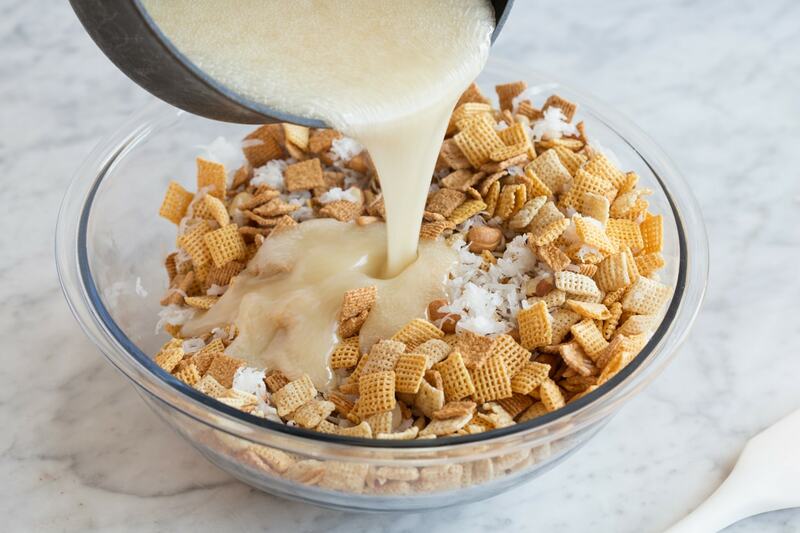 Remove from heat, stir in vanilla and carefully pour sugar mixture over cereal mixture and toss to evenly coat. *If you don't want the mix as gooey and sticky you can add an extra 1 cup of each cereal (totaling 3 extra cups), for a lighter coating.